Hi all! How are you? How was Thanksgiving?! Did you eat yourselves into a food coma – I did and it was wonderful. 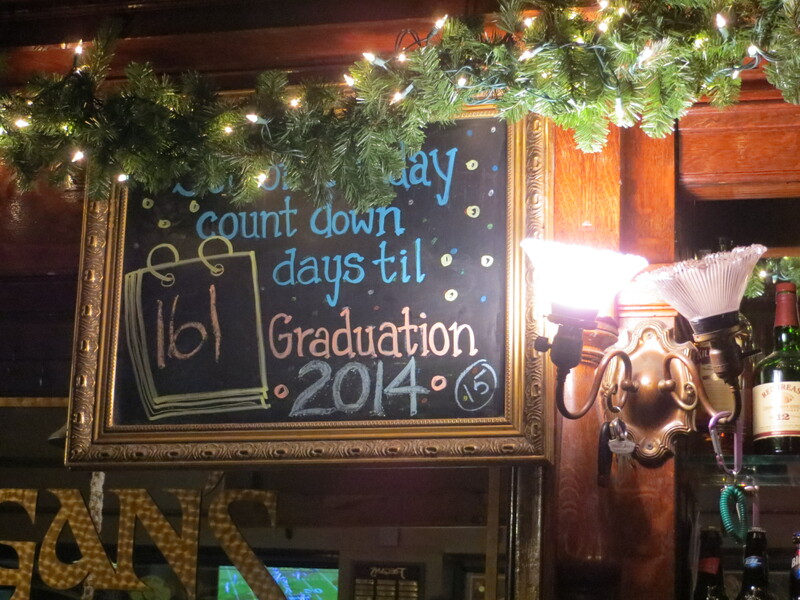 And sorry for the long gaps between blog posts… those pesky finals totally get in the way of everything. 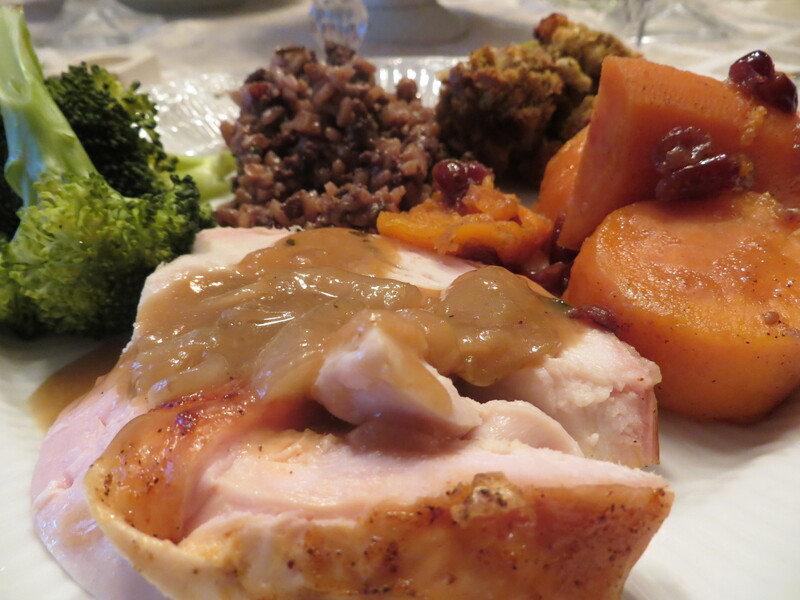 Let’s talk about happier things, like Thanksgiving. When we come to this time of year and someone asks me what my favorite food is, I say “Thanksgiving”. Granted it’s technically not one food, but it deserves to be classified as one. I hate turkey by itself but pair it with mashed potatoes, yams, and gravy, it is my favorite thing in the world (and everyone knows that the sides are the best part of Thanksgiving anyway!). We stayed home this year, so my mom took requests (yay!). It’s spanakopita pie (it’s Greek). It translates to “spinach pie pie”. 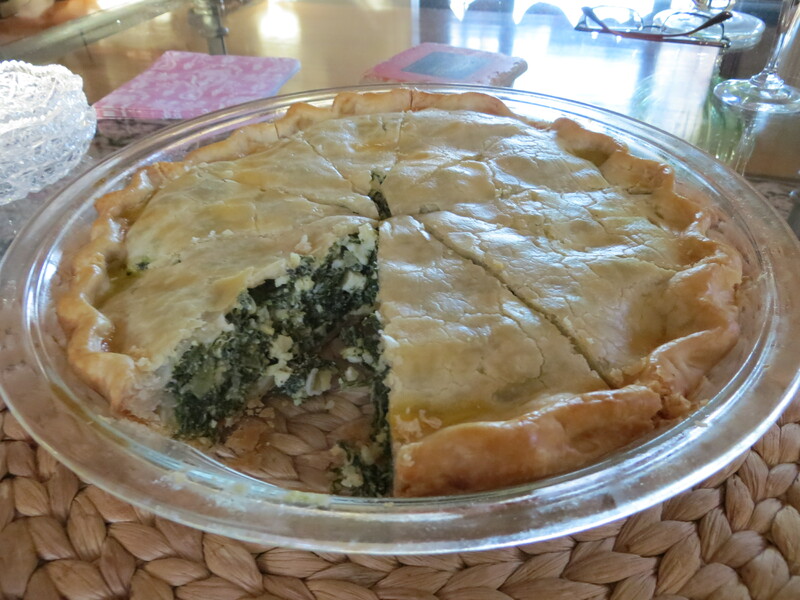 It is divine – the perfect blend of creamy filling (spinach, feta cheese, dill, and scallions) and flaky pie crust. This was a more substantial appetizer than the traditional phyllo-encrusted version, allowing us to sit around and relax before jumping into the main event because we were starving. It is even better with prosecco. After a brief photo shoot out in the frigid afternoon sun, we came in and enjoyed a festive feast full of traditional favorites and Greek fare! Of course we had the turkey. My mama uses this amazing Cajun seasoning on it, which gives it a spicy kick. 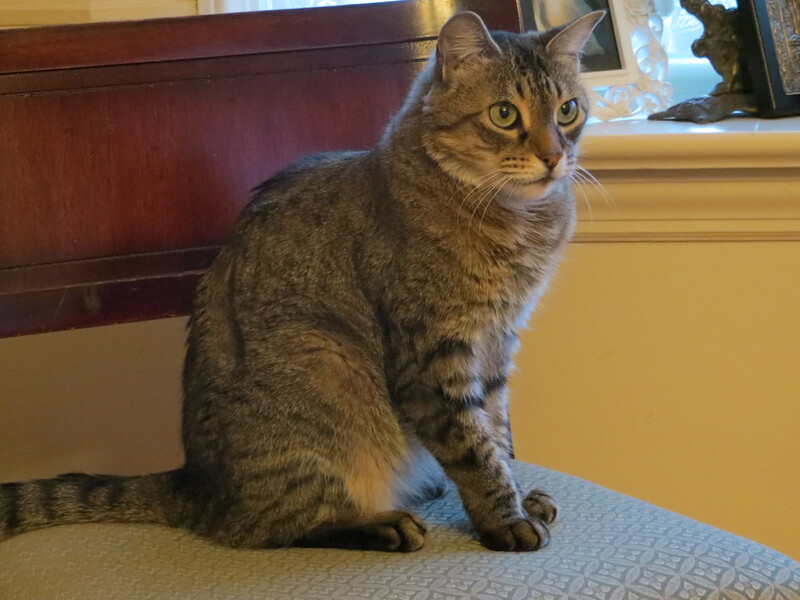 My cat’s an anything girl. 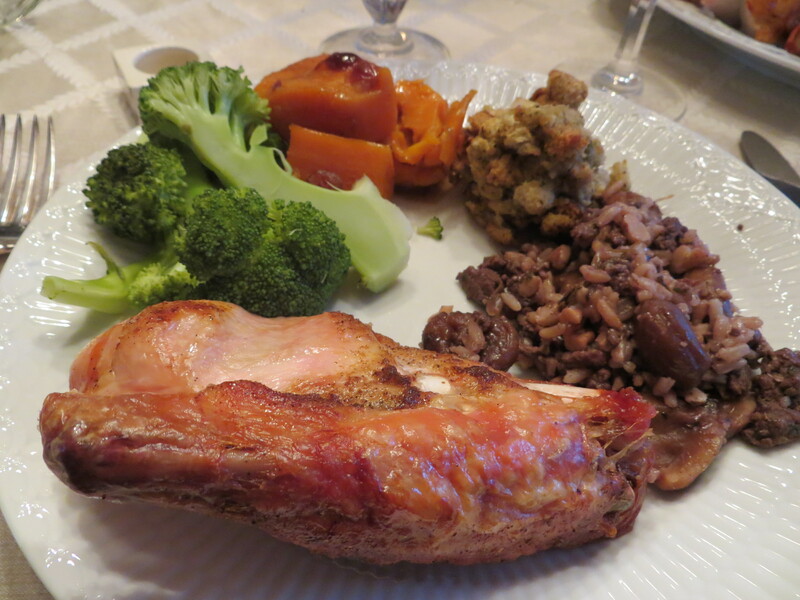 As you can see from E’s artistically laid out plate, we also had steamed broccoli, rum-glazed yams (yum! ), and Greek wild rice-chestnut-craisin-awesomeness stuffing. My grandma and mama make it every year for Thanksgiving and Christmas and it is addictive. It is a mix of salty, sweet, crunch, and soft – the perfect balance of flavors, textures, and temperatures. 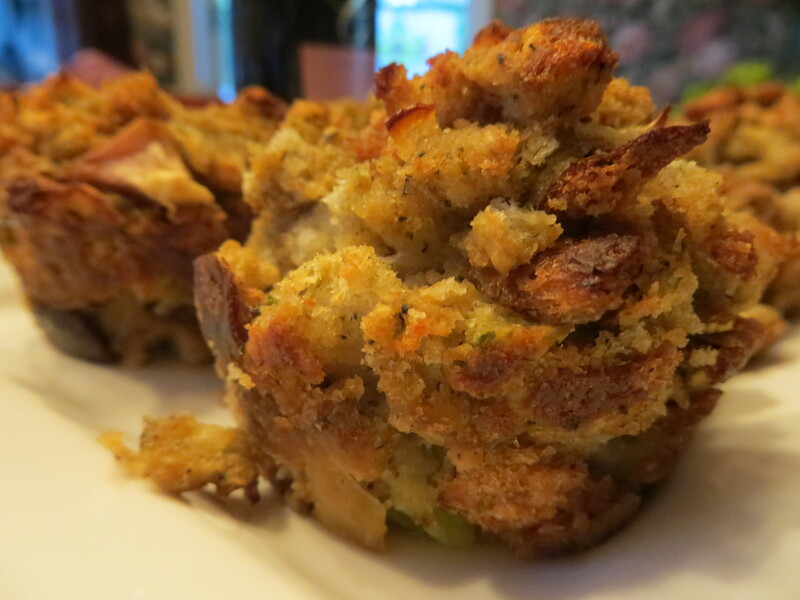 Finally, we debuted a new addition to our turkey day line-up – stuffin’ muffins. These are the brain child of a certain Food Network chef and as much as I really do not use her recipes, this one was pretty ingenious. We do not stuff our turkey (I’m sorry, but the food poisoning risk is WAY too high) and no one in our family really likes bread stuffing, so this was a big adventure for us. And look at all that crispy gloriousness! My mother was shocked that we gobbled them up. She did not realize that they were awesome vehicles for ingesting more onion gravy. 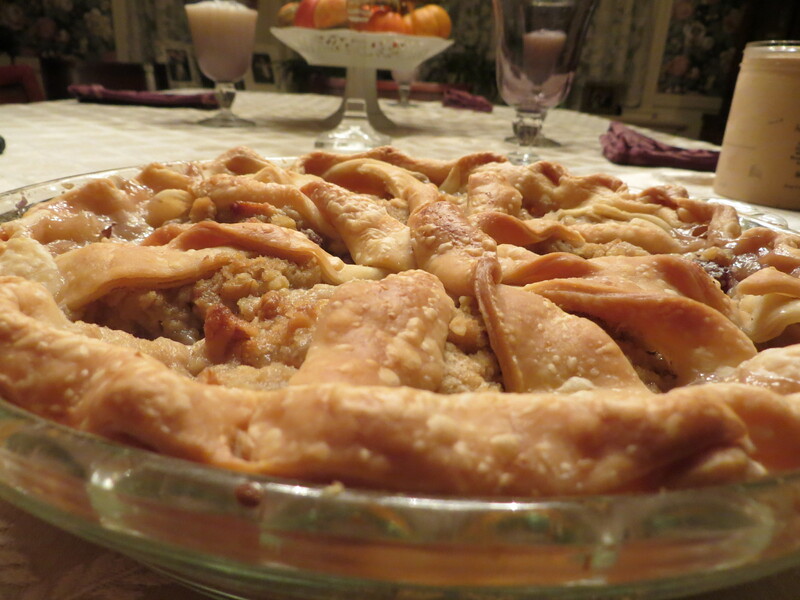 We finished up with Apple Crisp pie, the perfect marriage of down-home apple pie and the apple crisp. It was the perfect ending to a day full of food, family, and blessings. 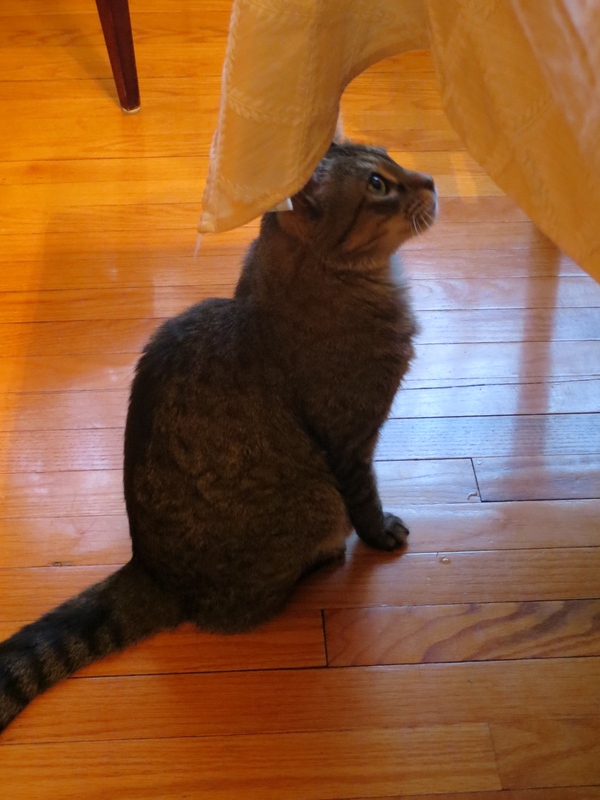 And the Cat was pretty thankful too!